Restaurant Review: Bluebird Barbecue | Out to Eat | Kids VT - small people, big ideas! My kids are 11, and when we go out to eat these days, they usually skip the chicken fingers and French fries on the kids menu and go straight for the adult fare. Their increasingly refined palates please me — until we get the bill. 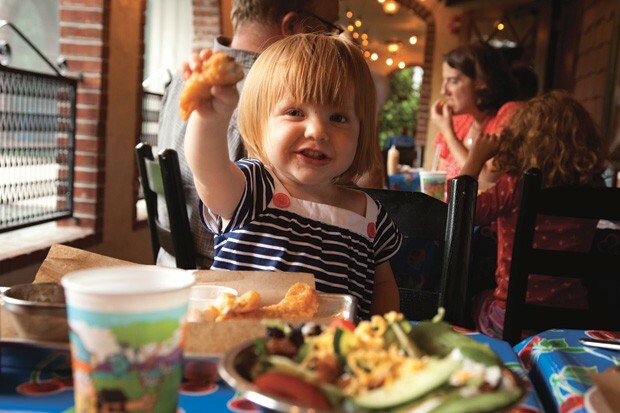 Which is why we went to Burlington's Bluebird Barbecue on a recent Tuesday night: Kids under 12 eat free from the kids menu with the purchase of an adult entrée. And there wasn't a chicken finger in sight. At 5:45 p.m., we were able to snag a table on the screened-in patio with a view through the woods to the Winooski River. The vibe at Bluebird is upscale barbecue joint: The vinyl tablecloths are more Martha Stewart than roadside dive. The cheap condiment squeeze bottles are filled with gourmet, housemade sauces: Kansas City-style tomato-based "red," Carolina-style apple vinegar, Memphis-style maple and from-scratch ketchup. We couldn't resist starting off with some southern-comfort appetizers. My son got the smoked wings with Scotch bonnet sauce. My daughter ordered a basket of hushpuppies, and my husband and I tried the cornbread. The wings were a four-napkin, two-wet-wipe affair that my son deemed "different ... but really good." Not so the hushpuppies. My daughter and I found them dry and tasteless — "like hard balls of fried corn bread," in her words. My husband appreciated the savory cornbread loaves with their serious pork undertones, but I prefer mine sweeter and cakier. These were fine, but definitely needed honey — lots of honey, in my opinion. Choosing main courses involved a great deal of deliberation. Did we want fried chicken and waffles? Pulled pork from the restaurant's wood smokehouse? Baby back ribs? And then there was the kids menu, which included mac and cheese, a pulled-pork slider, a smoked-chicken quesadilla and catfish sticks. Each entrée was listed for $5 to $7 and came with a choice of one side. After we made our final choices, the meals arrived on cute metal baking trays covered with parchment paper. Still sporting some Scotch bonnet sauce, my son tucked into his half rack of ribs with great gusto. He immediately declared them, and the restaurant, fantastic. "We can come back here, right?" he asked. His side of mac and cheese was creamy enough to have been Velveeta-based, but I later found out it was made with Cabot's American cheese. My daughter's pulled-pork slider from the kids menu was generously sized and came with a large serving of fries — plenty of food for a hungry 11-year-old. The shredded pork was smoky and tender. It was the perfect canvas for her to sample each of the barbecue sauces. Bluebird's are the best kid portions anywhere. My blackened catfish was cooked just right and intensely spiced — and delicious for it. The accompanying chewy and bland red rice was a miss, though. My husband enjoyed his lean and flavorful pork sausage, as well as his pit beans with cooked pork, which he found both smoky and salty. The kids gobbled up the traditional slice of white sandwich bread that came with it. After our smoked-meat gluttony, no one could fathom dessert — something that rarely happens when we dine out. Next time we come for Kids Eat Free Tuesday, we'll skip the hushpuppies and cornbread and save room for a Rookie's Root Beer float or slice of pecan pie.